Two out of three FREE cards made …. These were two of the cards three cards we made on Monday night. This first card was the trickest of all the cards but I had a few talented cardmakers attend and I wanted to challenge them a little (I hope I did!!). The new rhinestone brads are stunning and I think the Turquoise brad really made this card. Of course, I rarely make a card for people that doesn’t have Dazzling Diamonds too. So you can see the flower sparkling away! 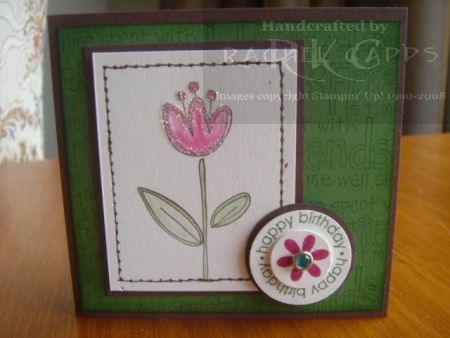 This card was inspired by another card on Splitcoaststampers … check out the other card here. Thank you for the inspiration! The second card was my own design. I came up with it by deciding I wanted to use our new Wild Wasabi Textured card stock, my new En Francais background stamp (I love it!) and my scallop circle punch (I love it the most!). Plus I knew I wanted a gift card size card. I only needed to add Boho Backgrounds, Priceless and Everyday Flexible Phrases to the mix to finish off the card! phew! It may sound full of everything, but it was really easy to make … and everyone had the chance to play with my new brayer and my new scallop punch! Watch my blog over the next few days and I’ll post the third card we made too. 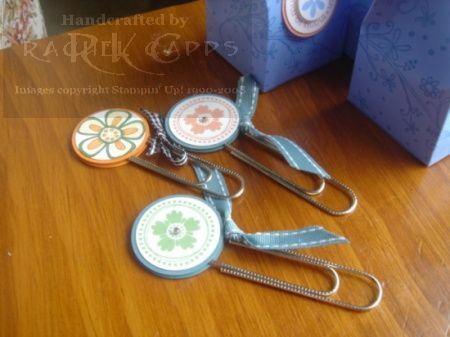 If you would like to play with a scallop circle punch too … then why not place an order with me today? You can place an order with me from anywhere in Australia. It’s really easy to do. Just email me and ask how. Wow! I think we all had a great night last night at my New Catalogue Launch Party. If you came along, what do you think? Aren’t these paper clips cute? 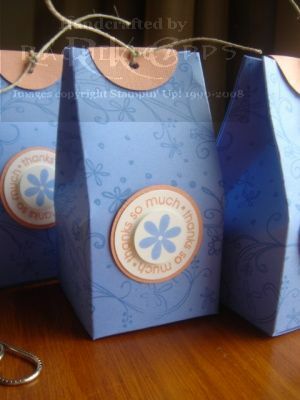 They are so easy to make … you simply need to have the Stampin’ Up! 1″1/4″ and 1″3/8″ punches and an image to stamp in the smaller circle punch. Then you stick together with Stampin’ Up! Dimensionals with some matching ribbon … and there you have it! I must also thank my awesome upline, Joanna Wassens, for the design behind this box. One of the great benefits of being a Stampin’ Up! demonstrator are the fabulous resources you have access to for inspiration. And Jo’s creation was my inspiration behind this box. Thanks Jo! Do you like the Punch Candy I’ve made? I adore our new Stampin’ Up! punches … in particular the scallop circle. It is the best $30.95 I’ve ever spent! 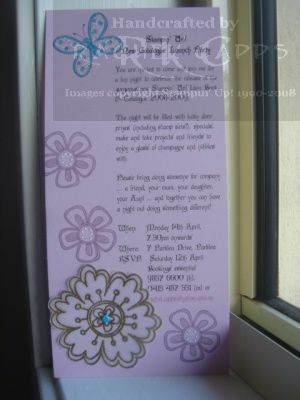 These can be stuck to any project you are working on, be it a card or a scrapbook page. 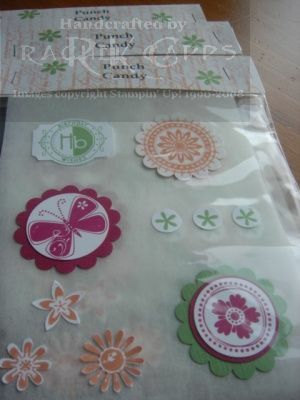 And this Punch Candy is made using three of the new Stampin’ Up! In Colors … Wild Wasabi, Purely Pomegranate and Groovy Guava. The paper cut out with the scallop circle punch is the new textured card stock, too. Oh, it is lovely! I’m excited!! The New Idea Book & Catalogue is open for business TODAY! 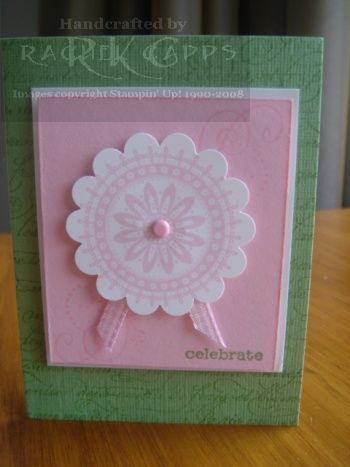 Finally, the time has arrived to order from the new Stampin’ Up! Idea Book & Catalogue. From today, 1 April 2008, we can all order from the new Catalogue. Whoo hoo!! Don’t you think it is simply stunning? I am forever thankful at how Stampin’ Up! never disappoints me 🙂 There are so many new and gorgeous products: my favourites are the circle scallop punch, the new In-Colours (particularly Groovy Guava and Wild Wasabi), the textured paper, taffeta ribbon, striped grosgrain ribbon, double-stitched ribbon, the Pretties kit, rhinestone brads, rub-ons and of course, the new stamp sets (I can’t wait to play with Fun & Fast Notes and Life Definitions!). Don’t have a copy? Would you like one? Well, why not book a party with me today and receive a copy for FREE. OR, you could come along to my New Catalogue Launch Party at 7.30pm onwards on Monday 14th April 2008 and have a browse. You should come on the 14th not only to look at the new Catalogue, but to have a try of some products in the Catalogue. I’ll have make-and-takes for everyone to try, there will be door prizes (and who doesn’t like to win a FREE door prize??) and lots of other FREE giveaways (who doesn’t like FREE stuff?? ), some champers and yummy food. Please come. I only ask that you let me know you are coming. So, bookings are essential. Oh, and watch this space so you can see what you’ll be making!! If you can’t make it on the 14th but would still like to purchase a copy of the new Catalogue, then they are $12.95. And if you would like me to post you a copy, until 30 April 2008, I am offering FREE postage anywhere in Australia. So, hurry and purchase your copy today!